Sir Philip Noel Caron was the Dutch Ambassador to the court from 1609 to 1624. He was a close friend of King James 1. In 1618 he founded an almshouse, in what is now Wandsworth Road. It was a long, two-storied building containing seven apartments built specifically for seven “poor but honest women”. Sir Noel Caron was a well-loved philanthropist and held in high esteem. At his funeral the streets were lined with the poor he had helped. He was buried in St Mary’s Lambeth with the Archbishop of Canterbury officiating. In 1819 it was noted that the payments under the will had long since ceased but had been replaced by an annual allowance of half a guinea (about 53p) for coal paid from the churchwarden’s accounts. At this time it is also recorded that a couple of other charitable funds (Countess Gower’s and Hayes Fortee) had become involved with the work of Sir Noel’s Almshouses. 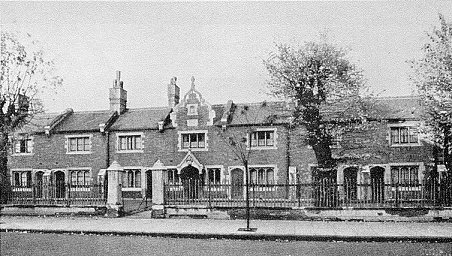 By 1853 the Wandsworth Road building had become unsuitable for elderly people, so it was sold and the current building in Fentiman Road replaced it. By the 1990s the cost of repairs and general upkeep was too much for the combined charities and following lengthy negotiations the Trustees granted a 50-year lease on the almshouses to the Family Housing Association. The homes were fully repaired and modernised and in the spirit of Sir Noel let to local women in need. They were officially reopened by the Dutch Ambassador in February 1997. This article was researched by Catherine Holland and is based on personal knowledge and a booklet on the Lambeth Endowed Charities.